For two days last winter I had the wonderful opportunity to shadow Arwen Dave, a systems engineer at the NASA Ames research center. I was really excited to get to spend time at Ames - having grown up in the area, I'd often passed by their gigantic wind tunnel and wondered what awesome science was at work inside. NASA Ames is different from other NASA labs in that very little of their work is actual rocket science. A lot of their work involves designing, building, and operating the missions that the rockets actually deliver. Ames has a focus on robotics research, which is the field I'm currently trying to work my way into. This opportunity came at a critical time in my search for career paths, as I had decided to put off grad school in order to try out future job paths before committing to one in particular. My main decision for which I was gathering information was whether continuing on in academia or shifting to an industry such as engineering would put me on a better career path. Ames was the perfect place to learn about future jobs, as there is a healthy mix of scientists and engineers working in close collaboration. My time at NASA was split between following Arwen around on her job, taking tours of some of the labs, and wandering around talking to people about their jobs. I finally got to see the inside of a wind tunnel, and got to geek out with the local machinist over their awesome equipment. Following Arwen was very informative in that, for the first time, I got to see what it is that systems engineers do with their time. It turns out that the majority of the work consists of collaborating with lots of different kinds of people to try and get a project designed and built. Working at NASA in particular seems to make the job harder, since there's tons of added bureaucracy to deal with, but also a whole lot more rewarding, since you get to see your creations put into space. Arwen tends to be working on a number of different projects at once, and had a few tips for me on how to seek out and create new work opportunities within an existing position. In the course of my visit to NASA I got the chance to talk to people from pretty much every step in the process of building space missions, from the scientists who come up with the original study to the machinist who builds and assembles the final result. Despite being very busy (even by Reedie standards), everybody was happy to talk to me about what they do, and these conversations definitely helped inform my job choices. As a result of these conversations, I'm now a lot more confident in my decision to work in industry before continuing on to higher education, and am much more informed on what everyday work for scientists and engineers is like. 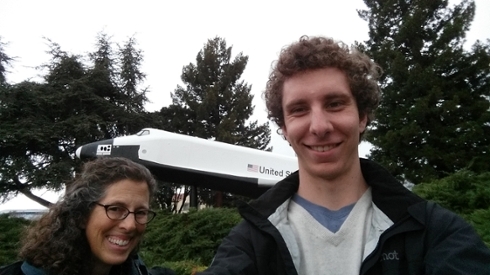 I had a great time exploring NASA, and I'm very grateful to Arwen and the other folks at Ames for showing me around.